When used correctly, any social network can become a great educational asset Liking Can Make You Smart: 5 Ways To Use Facebook For Education Liking Can Make You Smart: 5 Ways To Use Facebook For Education Facebook can teach us lots of stuff, but most of the time, it's nothing that we really want to know. But what about the real educational value of Facebook? Stuff that's -- oh, how do... Read More rather than an unintelligent distraction. You’re on those social networks a lot anyways, so why not make the best of them? But doing that means finding the right people to follow. Depending on your interests, that may be more difficult than it sounds. There are so many people and organizations on them, it’s hard to pick out the good ones from a sea of choices. To get you started, take a look at these eight great accounts any Instagraming college student should follow. If you love research and space, following the NASA Goddard account is a must. You’ll get a lot of pictures of astronauts, shuttle launches, and space shots straight from the Hubble telescope. Thankfully, the account also has a sense of humor and is fine with posting things such as flying frogs next to rocket launches. The Mars Curiosity Rover has its own Instagram account! As the rover continues to roam around the red planet, followers of the Instagram account get a glimpse at “unofficial, un-retouched” images straight from the rover. While you won’t be seeing any Martian skyscrapers in those images, who can help but nerd out a little about images from a different planet, even if it’s all just red dust? National Geographic is another perfect account that students of all disciplines can follow. NatGeo posts about all sorts of topics, including nature, animals, and cultures. In other words, this account can quickly open up your mind to the greater world and be appreciative of all the awesome, unique differences that exist out there. You’ll also learn a number of things about nature, which can boost your general knowledge or be extra helpful for biology and environmental science majors. The Smithsonian Magazine is another fantastic addition to your collection of followed Instagram accounts. The topics covered are generally the same as National Geographic, but while Nat Geo focuses more on nature and animals, Smithsonian Magazine focuses on culture and human achievements. You’ll get random facts from this account, which isn’t necessarily a bad thing — these little things can spice up anyone’s day. Best of all, this account is very active, so you’ll find multiple images every day. Do you nerd out specifically over marine life? Do you just enjoy pictures of sea creatures and oceans? Then following the NOAA Fisheries Instagram account is a must. Best of all, you’re not just getting interesting pictures, but also very detailed facts that go along with every picture. I’m personally not a big fan of sea creatures, but even I like to check out the account on a regular basis. The American Museum of Natural History is about anything natural and historical. The account tends to focus on dinosaurs and their fossils, but it covers any historic animal. On rare occasions, it even covers historic plants, so plant lovers won’t be left out. I think this is a more appealing form of history than “normal” history, usually. Unless, that is, you follow Histagrams, pretend Instagram posts made by historical figures If Famous Historical Figures Had Instagram If Famous Historical Figures Had Instagram What photos would Jesus Christ post up on Throwback Thursday? Who'd like Marilyn Monroe's selfie shots? Let's take a look! Read More . For completely different reasons, I simply have to include the Instagram accounts for Pearson Students and McGraw-Hill Students. Pearson and McGraw-Hill are the two largest suppliers of textbooks in the United States, and it’s surprisingly beneficial to follow their student-relations accounts. These Instagram accounts offer a sense of community and provide cool tips for college students, be it for studies, dorms, or more. Best of all, these accounts occasionally offer giveaways, which can include small goodies, a gift card, or free products from their respective publishing firms. If you’re not sure which of the two you’d rather follow, check who the publishers are for your current textbooks. Otherwise, I’d recommend the Pearson Students page because they’re far more active than McGraw-Hill Students, and have a better community going for them. I’m sure there are various other great accounts to follow, but these are six great ones to get started with. Once you have a handful of great educational accounts in your Instagram feed, it’ll slowly but surely make you smarter and more knowledgeable. Of course, don’t forget that you can also use Instagram for other educational purposes Kids Won't Put Instagram Down? 5 Fun Ways To Use Instagram For Education Kids Won't Put Instagram Down? 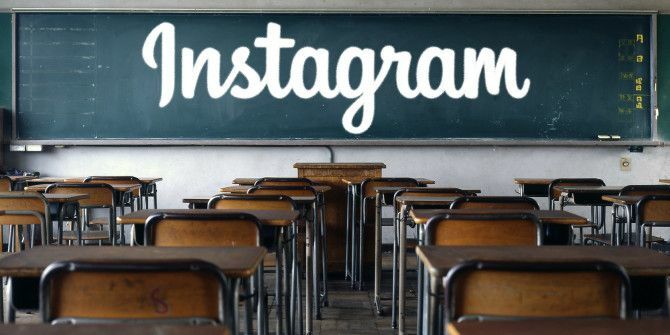 5 Fun Ways To Use Instagram For Education Smartphones and social networks can be a huge distraction factor for kids in school, and especially at home when they should be doing their schoolwork. Today's kids are all on Instagram, uploading and editing photos,... Read More , and not just for following educational accounts. We even have some tips for turning Twitter into an educational tool 10 Amazing Ways For Teachers & Tutors To Use Twitter In Education 10 Amazing Ways For Teachers & Tutors To Use Twitter In Education Twitter like all other social media is a virtual Aladdin’s cave. It is a gateway to riches. But just like in the story, this Aladdin’s cave is also booby-trapped. Use it right and you will... Read More ! To get the ultimate list of Instagram accounts to follow, I need your help! Which ones do you think are worth following as a student? Let us know in the comments!